NOTE: The type of the GLIDEIN_CPU attr is String (to accomodate the keywords auto, slot, node). Documentation was reporting Int incorrectly. Make sure your configuration uses the correct type or you may get a reconfig/upgrade error. NOTE: during the first "upgrade" or "reconfig --fix-rrd" you will see some warning because of missing RRD attributes. This is OK, is caused by the schema change. Several improvements to rpm packaging. Useful frontend tools are now available in the user path. Support splitting of factory configuration into factory's deployment specific configuration and entry specific configuration. Added the support for HTCondor GANGLIAD monitoring (requires HTCondor 8.1 or newer). If you have HTCondor 8.0.x or earlier you must remove /etc/condor/config.d/01_gwms_ganglia.config, otherwise your HTCondor will complain about an unsupported option and crash. Made several performance improvements to frontend. Frontend does several tasks in parallel to better utilize the CPU. Glideins now have the ability to track the worker node batch slot. 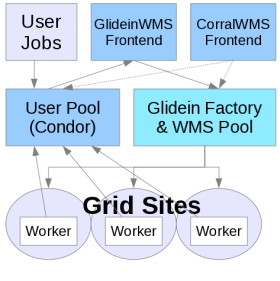 Based on the batch system at site (HTCondor, SGE, PBS, LSF, SLURM) the information is reported in the glidein's STARTD classad and logged in job's log file written by HTCondor using classad variables GLIDEIN_SiteWMS, GLIDEIN_SiteWMS_JOBID, GLIDEIN_SiteWMS_QUEUE and GLIDEIN_SiteWMS_SLOT. This is work in progress, so some pieces may be broken and the documentation out of sync. But it is a good place to look for what is going on. The option to have either the factory and/or the frontend provide the pilot proxy has been removed. The frontend must always provide it. Bug Fix: Fixed a bug where frontend would crash if the some of the internal files were trucated to zero length. Factory now supports glidein failure modes. This information is propagated back to the factory. Glideins now have different idle timeouts for startup and tail. The glideins now exit much faster after comleting jobs and they do not have enough time left to run another job. Consolidate the condor_tarball tag in glideinwms.xml to read in a list of os, arch, version. See docs for details. Ini-installer will default collector_port to 9618 if not specified in appropriate config sections. Improved logging when frontend fails to evaluate match expressions. Improved the means for distributing condor config files for different condor services. Bug Fix: Installers do not set CONDOR_VERSION as constant by default. This will now enable frontends to override this attr. Factory now limits the speed at which it releases held glideins. After too many unrecoverable attempts, held glideins are removed. New installations of factory and frontend services now communicate with condor daemons using TCP by default. KNOWN ISSUE: When the monitor work_dir is moved, reconfig/upgrade will fail. Recommended work-around is to delete the xml configuration in the work directory, change the work directory, then reconfig/upgrade. KNOWN ISSUE: If the work directory has changed, frontend startup upgrade will not create the group directories and then the frontend will fail (silently). If you are changing directories (e.g. from a RPM upgrade), you should copy the group directories manually. Reduced the number of debug log messages when entry becomes inactive. Pilot proxy is not available in the user job environment any more reducing the chance for user job using it. Bug Fix: ReqMaxIdle was grossly overestimated before. NOTE: To upgrade to this version from anything earlier than v2.5.3, please see the instructions here. Made quering of schedds efficient where ever possible. Added 'upgrade' option to factory startup script so that all the files in the glidein submit directory are updated. Did the same for the frontend startup script. 'reconfig' only updates the files populated with information from the configuration files (no scripts). The OSG rpm worker node client requires changes to glidein startup scripts. If you plan on using OSG sites that have used this rpm, you must "upgrade" your factory in order to get glideins. Bug Fix: Fixed a bug where factory would not advertise the entry under certain conditions when it was put in downtime. Bug Fix: Fixed a bug creation of START expression when VOMS proxy is set be required. Frontend publishes glideresource classad to the pool collector. This is useful for the users to do match making for their jobs. Factory can now resue old public key after startup to decrypt frontend requests. Grace time for old public key is configurable. The frontend now can set global limits on number of glideins. The frontend now can use more than a single CPU. glexec now tested during initial validation. Bug Fix frontend: Do not double count glideins when using multiple groups. Bug Fix frontend: Respect per-entry running limits. Bug Fix factory: The factory was not properly checking the security classes and setting downtimes. Bug Fix factory: Daylight savings is now correctly accounted for. Bug Fix factory: GLIDEIN_Max_Walltime is now used correctly. Added tools for comparing the Factory configuration file with what is published in information systems. Improved idle counting by the frontend when jobs match many factory entries. Add Java support in the glideins. Improved installation process using ini based installer. SIGHUP signals to glideins are ignored correctly. glideinWMS release is now available in 3 different tarballs, frontend only, factory only and a complete tarball. Version of glideinWMS is now published in the classads. Scheme can detect any changes to any service appropriate files and advertises version as patched. BUG FIX: Fixed a bug where factory would create a malformed glideinWMS.xml config file when configured to use a default proxy for glideins from the factory. BUG FIX: Fixed a bug where the LogCounts.rrd was created with wrong data types. KNOWN ISSUE: Automatic release of held glideins for CREAM CEs with issues could result in factory submitting more than required glideins to the CE. As a workaround, disable release of held glideins for CREAM CE. Entry does not print stacktrace when it fails to submit glidein. Instead it logs the error message appropriately. BUG FIX: Correctly interpret DN from a voms proxy generated from a service certificate. BUG FIX: Generate frontend's condor_config without empty values for certain configuration options. Empty values is not the right way to reset the configuration options. Fixed the incompatibility introduced in v2_4_1 in monitoring components. Support GLIDEIN_Glexec_Use in frontend config attrs. Frontend can mandate or make the use of GLEXEC optional. Used in conjunction with GLEXEC_BIN in factory config. If GLEXEC_BIN in set to NONE for an entry in factory config, it is assumed that the entry doesn't have GLEXEC configured on site. KNOWN ISSUE: Running glideinWMS v2_4_1 with Condor 7.5.3 has not been tested. Altough, most of the things may work, security changes in Condor may affect your installation. KNOWN ISSUE: Installer is not always able to get the correct DN from the certificates/proxies. It does not correctly strip the CN=>blah< bit of the DN in certain cases. If the DN guessed is not correct, make the required changes in the configurations and/or condor_mapfile. Add SecurityName to the frontend. Add DNs for frontend proxy and all the daemons the frontend talks to; create own Condor config file and gldiein gridmap file out of them. Frontend now dynalically creates GLIDEIN_Collector. Frontend now requires Match authentication. Add frontend autentication info to the factory config. Add support for different frontend identities in different WMS collectors. Put log files in a separate tree. Put client logs and client proxies in separate trees. Implement privilege separation in the factory. Various minor refactoring of code to achieve the above. Aggregate gatekeeper/sites for factory monitoring. Introduced monitoringgroups to group sites together for monitoring purposes in factory. KNOWN ISSUES: Installer is not always able to get the correct DN from the certificates/proxies. It does not correctly strip the CN=>blah< bit of the DN in certain cases. If the DN guessed is not correct, make the required changes in the configurations and/or condor_mapfile. Fixed a security bug in the way certificate/proxy DN(s) are handled. If you are upgrading the installation rather than full install, you should patch the condor_mapfile used by Condor daemons in your installation using the convert_condormap tool available from the glideinWMS download page. For additional security, users should add new DN to the condor_mapfile only by using the glidecondor_addDN tool available in the glideinWMS/install directory. Attempt to restart a crashed entry few times before shutting down the factory. Restarting is allowed for max restart_attempts in time interval restart_interval sec in te factory. Add vacuum option to manageDowntimes. Factory now properly handles new-style frontends without a group. Frontend code has been refactored to allow use as a library. Fixed a security bug in key handling. BREAKES BACKWARDS COMPATIBILITY! But it is needed. Fixed a logical bug in the glidein config that resulted in job preemption. KNOWN ISSUES: If using condor 7.4.0-7.4.2 and 7.5.0, USE_VOMS_ATTRIBUTESshould be set to false for Collector and negotiator to avoid potential problems and memory leaks in GSI libraries. WARNING: This release has security bug fixes and is not compatible with older releases. You will need to update all the daemons at the same time. Bug Fix: GLEXEC_JOB and GLEXEC_STARTER were not published in glideins classds. This was preventing psuedo interactive monitoring to work in case of GLEXEC. Addedd support for VDT 2.0, and made it the default. Added Globus-Client and Myproxy-Client in the minimal VDT install. Installer now allows the collector to run on non-standard port. Factory now only checks X509_USER_PROXY if it needs it. Added support for multiple versions of condor in a single factory. Added ReqEncIdentity to the frontend->factory protocol to prevent replay attacks. WARNING: This effectively prevents old-style frontends to talk to new style factories. KNOWN ISSUES: Pseudo interactive monitoring will not work with glexec. Fixed a bug that was throwing an exception if a glidein failed. Fixed handling of grid-mapfiles coming from client. Support multiple proxies... frontend drives this via plugins. Systems that installed v1.6.1 need to upgrade to this release. They only need to replace the glideinWMS files. Most systems don't need to upgrade. Add support for CCB and USE_MATCH_AUTH in the installer. Better handling of Nordugrid sites. Improved scalability, improved documentation and minor bug fixes. The XML file now supports comments. Installer uses both .profile and .bashrc. Frontend now requires integrity checks when talking to the WMS collector. Refactored install options so that most tasks performed as a non-privileged user. Using m2crypto for sha1 checks. Fixed startup bugs in various debug tools. The major new feature is a fix for VDT installation. Factory now changes public key at each restart. This is essentially a bug fix release for v1_5. It is safe to upgrade. Added flag that allows/requires proxies from frontend. Fixed bug in factory installation with encryption. The glidein now finds out about OSG squid. Fixed bug in the node blacklisting code. Contains several scalability features over v1_4_X. Contains a new secure message passing infrastructure. Warning: Explicit listing of gcb_setup may create problems. Warning: Explicit listing of glexec_setup may create problems. Randomized the retire time to smooth terminations. Can be controlled via GLIDEIN_Retire_Time_Spread. The factory config file is now read only. Added switches to limit log file growth. Warning: If upgrading from v1_4_X, the reconfig will fail due changes in the monitoring setup. Manually remove want_split_terminated_graphs switch in the XML file and the reconfig will work again. This is a bug fix and condor update release, and you are encouraged to upgrade from v1_4_3. Add factory_constraint parameter to the frontend. Add new protection against condor_submit errors. Warnings go into the info file, too. Easier to correlate errors this way. This is a scalability release, and you are encouraged to upgrade from v1_4_2. Added mutexes to reduce factory load due to monitoring. Previous releases were not really scalable to more than approximately 50 entry points. This is a bugfix release, and you are encouraged to upgrade from a v1_4_1. The changes introduced in v1_4_1 could leave behind zombies. Fix glexec setup script bug. It is safe to upgrade from a v1_4. Disable glidein UDP port by default. Added support for job wrapper scripts. gcb_setup is now loaded automatically. Add config section to entries. Add a completed job log. Made the most CPU intensive part of monitoring optional. Installer now supports multiple collectors. WARNING: If you used a previous version, consider reinstalling everything, including Condor. This version contains several key changes. Factory and frontend now gets sleep and advertize attr from config. Add downtime concept to the factory and relative management tool. Add command to get info about factory config file. Add init.d style startup script. Fix pseudo-interactive monitoring when glexec is used. Reduce VO frontend condor_q load by adding job_attributes. VO frontend now queries the collector and advertises result. Smarter algorithm to calculate min_idle, also using condor_status. WARNING: Entry points need to be recreated, if you used an older version. Fix glexec handling in condor v7.0.2 and above. Cut in half the number of condor_q's in the frontend. This version fixes a major installer bug and has monitoring over v1_2_1. It is safe to upgrade from a v1_2_1, however, the entry points need to be recreated. Better support for EGEE (by supporting $TMPDIR). This version has essentially usability and monitoring improvements over v1_2. It is safe to upgrade from a v1_2. Added stop scripts for factory and frontend. All commands now are executable. Add client and Condor-G monitoring in factory data. Greatly improved log stats monitoring. Add doc section on monitoring. WARNING: Security configuration has been overhauled to fix the security issues of the provious verisons. Please reinstall (or at least reconfigure) your Condor installation. During installation, Quill is now optional. During installation, Condor config can be split into condor_config.local. Files are now loaded in order specified. Added local_start.sh to ease testing. create_glideins code had a major rewrite, but users should not notice any major change. WARNING: The config directory structure has changed a lot for both the factory and the frontend and need to be recreated, if you used an older version. WARNING: The config directory structure has changed a lot and need to be recreated, if you used an older version. Add support for Condor 6.9.2. Move log and monitoring files into entry dir. Create proper ClassAd cleanup when daemons exit. A single factory daemon now can serve several entry points. The config file is XML based. Added monitoring information in the ClassAds. The glidein factory now has an extensive graphical monitoring. It is now much more stable and has better logging. The user documentation has been greatly improved and now describes advanced configuration options, too. Banner image by Madhusudan Katti used under Creative Commons license.